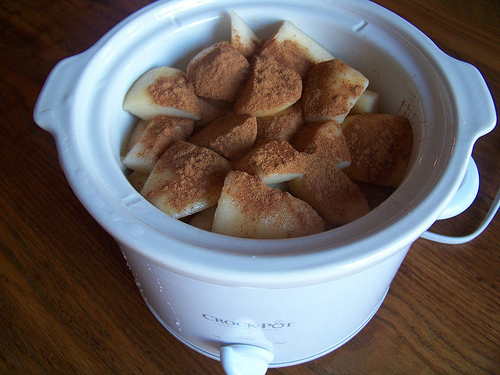 Dump chopped fruit in the crock pot and pour a about one cup of water over and sprinkle generously with cinnamon. Let this simmer for a few hours until the fruit is very soft. Drain off excess liquid, if any and mash with a potato masher or blend in a blender or food processor. You can store this in the refrigerator in an airtight container for at least a week. It makes a delicious and healthful addition to any meal! « Enter to win a free Vita-Mix! I love putting applesauce or pear sauce on toast! Will be making this soon! I freeze mine all the time. We get pounds and pounds of apples off our families farm in the fall and I freeze enough for all winter! Yes, it freezes well. I freeze it in ice cube trays and then put them in ziploc freezer bags. Just pop a few cubes in the microwave and you’re good to go! Ooh, thanks! 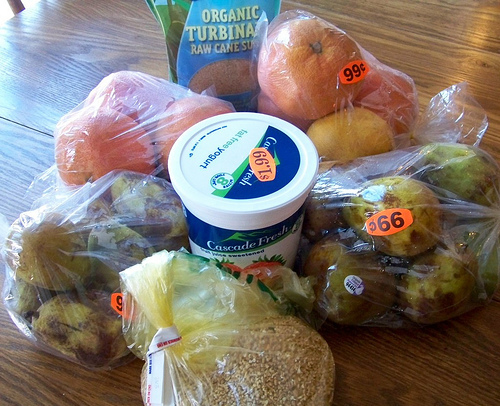 I had been wondering about making pear sauce in a crock pot, as I just bought a huge bag of pears at a great deal. Perfect timing – thanks! Thank you! My son is too sensitive for applesauce (think immediate evacuation), so this will be great. 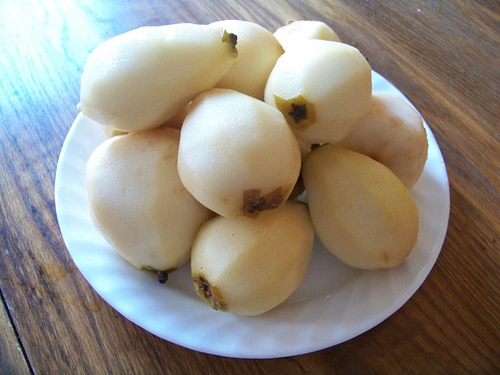 Pears can have quite a laxative effect, so eat them sparingly until you know he can handle them. Thanks. He can handle them QUITE well. He loves them. The Del Monte fruit chillers are a pear base. And we make him pear rings when we have apple rings. So far it just seems to be Apples, I hope it stays that way. 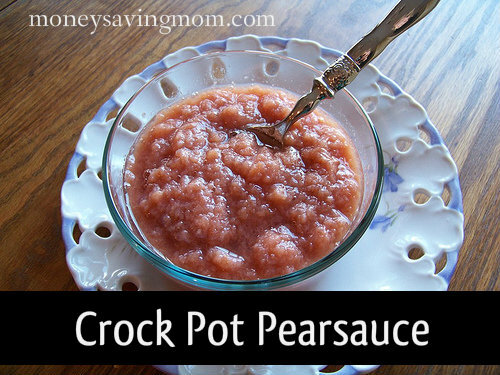 I’ve been wanting to make crockpot applesauce for ages but PEARsauce never dawned on me!! I LOVE pears!! Definitly going to be trying this very very soon! My son will love it as well! I love making apple/pear sauce too! Though I’ve found that if I cook the apples on the stove with just a little bit of water and the cinnamon that they will completely fall apart into “mush” on their own and there is no need to mash or blend them. That’s probably just a function of how long they cook. I do mine this way too! Sometimes I make what I call short cut applesauce buy one jar of regular applesauce in the store cut up apples cook on stove top but not enough time until dinner for them to be completely mush but no one cares they have appleslices in the applesauce and they are all happy! I love blending a few pears into my applesauce instead of using sugar. This past fall, I canned some applesauce for the first time. I’ve LOVING it right now! I also freeze it in plastic containers. Does applesause freeze well? I’d love to try this recipe but I’m nervous we won’t eat it all in a week and it’ll be wasted! We made a lot of unsweetened applesauce this fall and stored it in quart size freezer bags laid flat in the freezer (takes up less space this way) and it tastes just fine. It’s been great for using in recipes as a substitute for some of the oil/fat called for in things like muffins and it keeps the baked products really moist. Plus my girls really like eating it as is! I highly recommend it! My Mom has been freezing applesauce for years and now my sister, sister-in-law and myself all get together to make, divide and freeze it. Freezes beautifully and my kids love it partially frozen–I don’t even have to take it out in time to thaw completely before dinner. I do this all the time and I actually don’t even peel them. I sometimes add granola while it’s cooking or after. Do you take the peel out after it’s cooked, or do you mash it in together? Sounds very similar to how my mom makes apple butter. That looks soooo good. I wish I could find some discounted pears. The ones I see are very expensive so we peel and eat! I make applesauce this way and my kids love it! My freezer is stocked with several bags of it right now. Thanks for sharing! What a great way to use of the soon to be expiring apples and pears. Love the idea of freezing it too! Can anyone tell me if this freezes well and for how long it will last? My mom used to make pear sauce and froze it. It worked just fine. She used plastic storage containers, but bags would work well too, as long as the sauce is cool. I freeze it in single servings in silicone muffin “papers” and pop them out once they’re solid. They will last sealed in a Ziploc for three months, easily. We freeze our applesauce in the square plastic storage containers, and it keeps til the next freezing time comes around, so about a year and its still good. Tomorrow I’m canning applesauce instead to free up freezer space. I love making homemade applesauce! I’ve tried serving it after only mashing it with a fork, but my kids will only eat it if it has the same consistency as the store-bought stuff. So I usually end up pureeing it in the food processor. Very tasty, and so good for you! Yum! I love homemade applesauce! I do this, but then leave it in the crockpot to cook down overnight, and then I’ve got pear or apple butter, which I prefer to the sauce. It’s so nice not to have to worry about stirring and scorching! I do this all through the fall – and I never peel the fruit, as I use an immersion blender right there in the crock to get the consistency I want. The kids LOVE it. You can freeze or water bath can both applesauce and pear sauce. I make both in the fall from the fruit off our trees. My husband hates pears, but he LOVES pear sauce! I was the same way. The first time I got pears, I went with a friend to get them and we canned them up together. When I told her I didn’t even like pears, she was asked “Then why are you doing this?” Turns out, I like pear sauce and sliced pears on philo dough! I just never liked the pears in the fruit salad that comes in a can so I thought I didn’t like it. Now, it is a different consistancy than apple sauce (which you can almost drink down), pearsauce has the roughness to it, but as long I remember not to ‘chew’ it, I’m okay. Do you have a special tool that you use to peel your fruit? I have been making apple and pear sauce for my 2 yr old daughter since she was an infant that is a fabulous idea to put it in the crock pot. Also I wanted to share that you could put it in individual containers and freeze then take containers out the night before you will use them. You could also make several batches if you get a great deal and put in larger portion containers and take out as needed. This way you could take advantage of a great deal and not let any go to waste. Crystal, can you tell me approximately how many apples/pears you use to make the sauce? Truly, you can make this with as many or few as you’d like. 8-10 makes a nice batch, but you can do more or less. 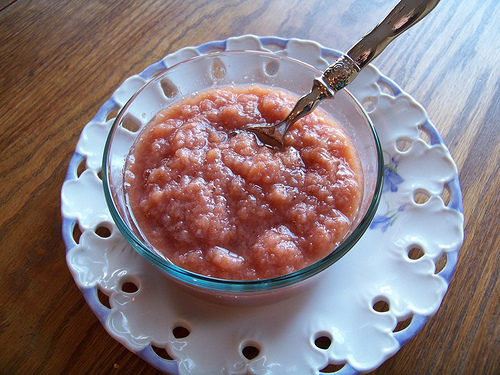 I froze applesauce and pear sauce when I made my own baby food. You can freeze it in ice cube trays, then pop the ice cubes out into a container or Ziplock. Then you can take out 1 cube at a time or however many you want. I too use applesauce in baking recipes that call for oil. I never thought about freezing it for this use. If you got a good deal on apples and froze some in ice cubes, you could pull out a few at a time to thaw and use in baking recipes. Mom and I are canning applesauce tomorrow. Our local fruit stand had seconds of the Golden Delicious for $9/bushel. I bought a bushel and a half. I’ll be doing the stovetop method, since it will go much faster, and we’re using the Victoria’s strainer so we don’t have to peel or de-seed any apples… it goes much faster! My kiddo (2) loves oatmeal with applesauce and cinnamon, so we’re going through applesauce like crazy. He’ll eat applesauce all the time if we let him. My question is: where (and when) do you find cheap pears? I love pears, but I hate the price of them! If you can find someone with a tree (or two or three) that is probably the cheapest way. It just takes your time to go pick. Otherwise I would just watch the sales and keep your eyes open for any marked down. Pear sauce looks SOOOO good! I never thought of doing this in the crockpot! Thanks for sharing! This is definately a project my daughter, 7, will love to help with & watch throughout the cooking process. Now I may even get her to eat pears! I just finished making a huge batch of pear sauce two days ago. I think the way I do it is both faster and easier, at least for me. I’ve done it in the crockpot, but I prefer to cook them in the oven in a Le Creuset with the lid on. It’s about an hour with the Le Creuset pot in the oven vs hours with the crock pot. I don’t ever add water to it whether I use the crock pot or the oven – the lid pretty much seals the liquid in and creates enough of its own juice. I hate the idea of draining off the excess liquid, as that is nutrients going down the drain. I’m also too much in a hurry to peel. I wash all my fruit very well with a vegetable wash, quarter and core and throw in the pot. Sometimes I put cinnamon in, but not always. I never need to add sugar. I do the same thing with apples. When I’m all done, I just puree the living daylights out of it, skins and all. 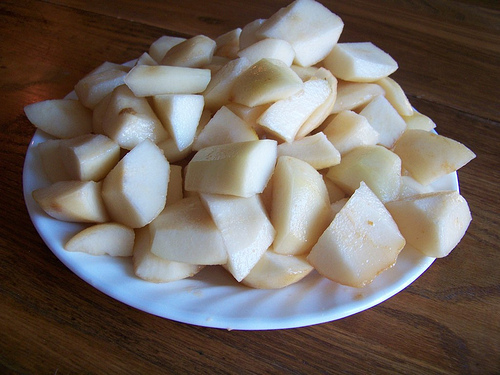 Thank you Laurie for your comment about cooking pears. I will be doing it now as you suggested. Skins on & no added water & no cinnamon. I will freeze it in ice cubes & add a cube or two into any stew/stock dish that I cook! Thank you! I always buy carrot apple sauce for my daughter at trader joes. Wondering if I could sneak a few carrots in here. It really adds up $$$ buying from TJ. Has anyone tried adding any veggies to this? I definitely think you could. I have never thought about adding veggies. I’m going to try this with the big box of apples I have in my garage from Azure. I need to get those puppies used up! It was passed down to me from my great-grandmother! Perfect! Now I know what to do with the Apple Pears hybrid that we decided to try and ended up not liking so much. I bet turned into apple/pear sauce they would be delicious! Is the red color from the cinnamon or from enzymatic browning? If it’s enzymatic, could you stop this with a little lemon juice? I always have a problem when I make anything in the crockpot of cleaning up afterwards. I have found these bags by reynolds that you place inside your crockpot before you cook anything. It doesn’t change the recepie or the food in anway! It just makes cleaning up so much easier! (my husband really enjoys them!) Have a great day all! Sometimes I get lucky at the market and happen to fall upon the produce workers removing the imperfect fruits such as pears and apples and even some veggies from the bin. More than once I’ve offered to purchase the whole box that was going to be thrown out. Never has there been anything rotten in there just bruised or browning fruits and veggies. This is a good time to whip out that crock pot. If ever you find that you have more than can be eaten that week, apple or pear sauce make awesome homemade fruit rollups. Just use pineapple juice instead of water or keep the water and juice a lemon into the sauce, throw it into the dehydrator and for the next eight hours or so you have perfect, well behaved, and very helpful children. None of mine would risk the horror of having to watch the others nom on leathers. What are the best apples to make sauce with? I found a large bag of mixed apples marked down to 1.49 at Bi-lo and used all of them, tasted just glorious! I lucked out today, and found two large packs of bruised, marked down pears for $1/ea! Pear sauce is cooking now! Can you can it instead of freezing?